Nils Frahm’s solo piano set offered a partial reading of his recent album The Bells, with compositions extended or altered to fit the mood. He opened with Said And Done, a single note, repeated for a while all on its own then enriched with an underlying melody, as if to call for attention. On the lengthy second piece, a fluid and versatile mid section found itself framed by sections of In The Sky And On The Ground. The light flow of the melody was at one time shaken up by a short thunderous moment, echoed to much greater impact on a hefty section of the following piece. This ominous and at times slightly heavy part, close to The Bells’s Down Down, later gave way to a much more vibrant second half, notes flying out with impressive speed and flow for some time, before eventually collapsing in a much gentler closing sequence. Frahm concluded his set with a wonderfully light and airy piece, placed there in sharp contrast to some of the earlier darker undertones. Opting for a more elaborate set up, with piano, laptop, xylophone, cello, electric violin and tape loop, Greg Haines, accompanied for the occasion by violinist Strie. Haines’s music is in essence much more minimal and yet denser than that of Frahm, and in a live setting, it becomes even denser and urgent. When combined to form a strong core, deep loops of cello, layers of violin and piano and electronics can produce a particularly intense wall of sound. Equally, taken apart and isolated, each component can serve as the barest of platforms for the pair to elaborate on. This was particularly the case on a piece entitled The Spin, which saw a very effective dialogue between piano and violin. The pair built even more striking moments later on, with Haines splitting his time between piano, cello and electronics, while Strie was building layers of violin. On the last piece, which opened with a slow progressing organ /section/, onto which were added ever more compact and denser layers of violin and, for a moment, cello, punctuated by percussions, until the music reached deafening level. As this all dissipated, with a single layer of violin and cello left, Haines faced the piano once more, and as the hall was retiring to silence, he began play a sparse melody to bring his set to a close. 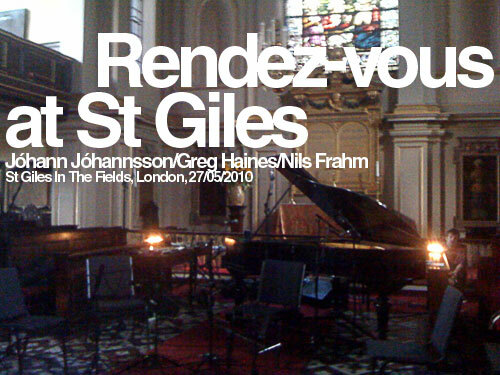 By the time Jóhann Jóhannsson, accompanied by a string quartet, took to the stage, St Giles was plunged in near darkness, lit only, feebly, by clusters of candles and projections onto the back wall of the church, and much more harshly, by the lights on the music stands. Here again, the scope was different from the previous performances, minimal, at times, ample and voluptuous at others, as Jóhannsson served measured electronics to underline the sparsity of some pieces, at times literally slicing through delicate string sections, or bringing a natural grain to some others. Performing tracks from various works, including a number of pieces from his recent And In The Endless Pause There Came The Sound Of Bees album, Jóhannsson and his ensemble created a somewhat reflective mood perfectly adapted to the sombre surroundings. Taking in the exquisite swathes of strings, the granularity of the electronics and the elegant fluidity of the piano, the audience were clearly under the spell of the composer’s music. There is a natural melancholy to Jóhannsson’s work which resonates particularly effectively live, and this evening was no exception, especially as the surprisingly warm haunting electronic voice of Odi Et Amo rose far above the mournful string work and Jóhannsson’s economical piano chords, the natural spiritual undertone of the song gaining a particular density in the settings of St Giles. Returning for an encore, as Jóhannsson’s computer crashed, the string quartet promptly reacted by playing a short impromptu price while Jóhannsson was getting back on track, the complete ensemble performing two additional pieces to bring a wonderful evening of contemporary classical music to a close.